Earlier topic: Canadian manufacturer of photopolymer plates? Typefounders Phoenix revival type info. Paul Ritscher just mentioned on another thread that Typefounders Phoenix catalog “Volume 10” contains information about the original foundries that issued the faces that they (Charles Broad) cast revivals of. In 36 years of collecting type, I have managed to pick up the lion’s share of TP offerings. And can confirm most of this information and will add notes of my own. There were successive catalogs that followed this with additional offerings, but I am going to simply concentrate on Volume 10 and simply run through what is shown in there. Bruce Mikita - Bruce Ornamented #1048. This was originally named Rustic Ornamented Shaded, designed by Julius Herriet, Patented Feb. 12, 1867. Circus - Bruce’s Ornamented #881, c.1865. This was shown much earlier by some French founderies. Corinthian - Illinois Type Foundry, Ornamented #441. c. 1869. Also shown by the Connor Foundry as well as Reed & Fox in England. Diamond Inlaid - Bruce’s Ornamented #1071. This was designed by Herman Ihlenburg. Dresden - BB&S. Originally from Schiftguss A.G., Dresden, Germany and offered by BB&S in 1925. Ecclesiastic - Bruce’s Ornamented #540. Egyptian Shaded Extended - Illinois Type Foundry. French Clarendon Shaded - MacKS&J. Designed by Richard Smith in 1871 and patented by MacKS&J on March 21, 1878. Grimaldi - Central Type Foundry (St. Louis - NOT Boston as stated in the catalog). c. 1886. Gold Rush - Bruce’s Ornamented #1514. c.1865. Ionic Shaded - MacKS&J. c.1860. Japanet - Great Western Type Foundry (incorporated into BB&S). Originally cut for the Chicago Herald to be used for sub-heads in 1893. Its original name was Wedge Gothic. Jim Crow - Dickenson Type Foundry (Boston). c. 1850. Its original name was Gothic Shade. Lariat - Never was a cast foundry face, it was drawn by Helmuth Thoms in 1963. Latin Ornate - James Conner’s Sons. The catalog says it was Italian Ornate. My Conner’s catalog shows it as Latin Ornate so I have no clue where “Italian Ornate” came from. This face was designed by A. Little and appears in the 1888 catalog. Marbleheart - Charles T. White & Company, New York. This is also shown in McK,S&J’s 1878 catalog and also the Boston Type Foundry’s catalogs c. 1870s. Pacific - American Type Founders. c. 1892. Pekin - Great Western Type Foundry (incorporated into BB&S). Its original name was Dormer. Phidian Revised - drawn for Charles Broad. It is bascially Phidian without the dropshadow. Relievo - MacKS&J. Actual original name is Relievo No.2. This face was designed by Herman Ihlenburg in 1878, but strangely enough it was patented by R. Smith & W.W. Jackson on Apr. 15, 1879. Rustic - Bruce’s Ornamented #864. This face was designed by Julius Herriet for the Figgins Foundry in England in 1845. Note the different shadow (or lack of shadow) on each different size. Circular Script - MacKS&J. Patented Oct. 2, 1883. Southern Cross - Bruce’s Ornamented #1041. Also shown as Ornamented No. 9 by the English foundry Miller & Richard in 1857. Staccato - William H. Page’s Wood Type Album. Page showed this as Tuscan Extended in his 1872 catalog. Another wood type manufacturer, Tubbs also showed this as No. 2106. This style is also shown as a foundry face by the Bruce Type Foundry. Tangier - James Conner’s Sons. Originally named Ornamented No. 43. c. 1857. Thunderbird - Charles T. White & Co., New York. Originally named Tuscan Broadguage. It was also shown by Farmer Little in 1885, but also even much earlier by the Marr Foundry (Scotland) in 1853. Thunderbird Extra Cond.- Charles T. White, New York Typefoundry. c. 1860. Trocadero - Illinois Type Foundry. Originally named Ornamented #25 by the ITF. Also shown as Ornamented #23 by Conner in 1865 as well as Great Primer Ornamented #8 by Farmer Little in 1865. Tuscan Graille - Bruce’s Ornamented #1046. c. 1860. Also shown as Ornamented No. 25 by Caslon in 1865 and Ornamented No.22J by the Cincinnati Type Foundry. Los Angeles Type Founders named this face Stellar when they offered their revival castings. Tuscan Ombree - Bruce’s Ornamented #847. Also cast by James Conner’s Sons, Farmer & Little, and the Cincinnati TF in the USA and earlier as Romantiques No. 2 by the Founderie Typographique Francaise and as Tuscan No.3 by Stephanson Blake in England in 1849. Tuscan Ornate - originally an English design c. 1850 and later cast as Romantiques No. 5 by the Founderie Typographique Francaise c. 1870. Tuscan Outline - Bruce Ornamented #851. Also known as Carnet De Bal. Originally named Ornamented No. 1071 from the Laurent & Deberny Foundry (France) c. 1830. Vaudeville - Nothing known about this one. Wayzata - MacKS&J. Also shown as Ornamented #1541 in Bruce’s 1901 catalog. On the previous thread the question originated about Typefounders Phoenix’s “Old Carnival” shown in a later catalog. I recently found it shown in an 1865 Bruce catalog as 6-line Pica Ornamented No. 5. I hope this information may be of use to others that have revival castings from Typefounders Phoenix or their successors - L.A. Type Founders, Barco/F&S, and now Skyline Type Foundry. Share any additional info you might have. Very good info there Rick. I’m going to copy and paste this information into a notepad document for future reference. I like viewing the original huge size photos there. Sky Shipley has the matrices for most of these faces (if not all), but unfortunately the location of the ornament matrices are currently unknown. Dave & Rick, I have a font of GRIMALDI but didn’t see it in the #10 1962 catalogue of Type Founders of Pheonix. Any ideas why it wasn’t listed? On another note… I have 24, 36, and 48 point BRADLEY OPEN, this type I’ve had for 25 years now and was new when I got it, I have pulled some repo proofs over the years…. what can you tell me about it, Thanks, Carl. This is all marvelous information! Paul - any chance we could convince you to scan that Phoenix catalog no. 10? Great stuff; I’m printing all this off and putting it in the archives that I keep with and for the Chas. Broad matrix collection. Rick I would differ with you, however, on your note for Dimension. Research done for me by David ‘Dr. Documento’ MacMillan turned up the following: “It would seem that ‘Dimension’ is a copy of ‘Calypso’ as designed by Roger Excoffon for Fonderie Olive (Marseilles) in 1958.” (He included an image from Jaspert, Berry, and Johnson’s _Encyclopedia of Typefaces_.) It seems to have acquired the name “Dimension” when it came across the Atlantic. Here at Skyline Type Foundry we have the matrices for all four sizes, as made (probably in Japan) for CB’s Typefounders of Phoenix. Interestingly, they are all stamped with the name “Calypso” except the 48pt, which is stamped “Dimension”. We cast and offered the 24pt in March of this year, and it was a colossal dud! WOW! Don’t know how this got on the digital typeface thread in Briar Press, because I hardly ever peruse that. Anyway, when I originally posted this in the Press and Typeface Identification section of Briar Press on Nov 27, 2012 I did start out with Anglo, etc. Don’t know where that part got dropped by the time it got here??????? Sky, I knew about Calypso/Dimension but simply put down what Charles Broad had put in that catalog. I was in a hurry and apologize for not slowing down enough to look that up properly. I did have an opportunity to pick up that face many years ago. I was intrigued with the design and look of it, but I think the overpowering criteria for not getting is was probably something like “what the Hell would could I ever use it for?” - so perhaps that is the reason that the offering was a dudd. It certainly has rare and unusual covered in spades. As I mentioned in my original posting on this. There were several other subsequent Broad offerings after this particular catalog was printed, and I didn’t have the time just then to try to look them all up. Grimaldi is one of those faces. It originated at the Central Type Foundry in St. Louis around 1886. It aligns perfectly with Bradley to make a chromatic font. I’ll try to make it a side project this winter to post the ‘other’ Typefounders Phoenix face information. OK. I think I figured out how this thread got here. I do remember entering all of this data only to discover that I had missed the beginning showings. I simply decided to save it and go back and enter the begining data later. Somehow it dissapeared on me! I recall being really pissed off about that and simply went back a day or so later and started from scratch. Apparently I sent the original data to the Digital letterpress forum. I’ll be damned if I know how that happened, but I guess I am getting to the age when I can expect to have a ‘senior moment’ now and again. Good news from The Type Heritage Project! Nos. 1 and 3 have been “fonted” by a THP Partner, who is working on No. 4 (specimens are rare! ), truly one of the most spectacular typefaces of all time—can you imagine cutting it in hard steel nearly a century ago? 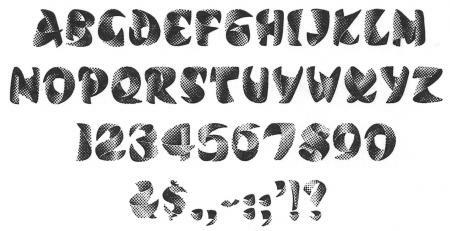 Digital revivals of these fonts will illustrate a textbook series entitled “The Type Heritage Project.” Volume I, “Quintessential Victorian Display Faces,” is in preparation. N.B. The attached image of the Romantiques Collection is excerpted from McGrew’s “American Metal Typefaces of the Twentieth Century.” As the title implies, McGrew’s expertise focused on American typefaces of the 20th century. Information presented on imported faces of the 19th century is not necessarily accurate. Letterpress buffs are cordially invited to visit www.typeheritage.com and/or www.forums.typeheritage.com for interesting font-by-font histories compiled from the 19th-century literature, ephemera and US design patent applications submitted by citizens and non-citizens. I am working on a casting of Egyptian Shaded Extended using the old Phoenix Type Foundry mats and am trying to find more information about the history of this particular face. I know it as identified as having come from the “Illinois Type Foundry” but nothing more than that. I’ve been looking through all my sources and keep coming up blank. Anyone have any insights into the origins of this face? Man, I really need to get a cool nickname. You could also add Schuyler “Sky” Shipley to that list, he’s not only the owner of Skyline Type Foundry, but also a retired airline pilot. There is also Rick “Foolproof (Press)” von Holdt. This is not meant to say that I am infallible (far from it). I simply started as a Fool with a proof press - and thus the name Foolproof Press. This list is great! Like others here, I’m making a copy to keep with my Phoenix brochures. Question: Where did you get the information that Julius Herriet designed Rustic for Figgins in 1845? Loy doesn’t mention him working in England, but he came to America around that time so it is quite possible. Over the decades, I have always added any tidbits of information I found about typefaces in my own collection to my card files I maintain about those faces. Unfortunately, I never got into the habit of documenting where I acquired the actual information. A lot I can remember, but there is also a lot that I don’t not recall the specifics on. This is one of those I do not recall. I can tell you that I am highly skeptical of some of the information floating around out there, so I am usually fairly careful to make sure my sources are reliable before I add the data to my files. Very rarely have I ever had to go back and correct and correct any of these gleanings. I started out simply wanting to have the information for my own education.